Citation Information: JCI Insight. 2019;4(1):e120722. https://doi.org/10.1172/jci.insight.120722. Acute lung injury (ALI) is characterized by exuberant proinflammatory responses and mitochondrial dysfunction. However, the link between mitochondrial dysfunction and inflammation in ALI is not well understood. In this report, we demonstrate a critical role for the mitochondrial NAD+-dependent deacetylase, sirtuin-3 (SIRT3), in regulating macrophage mitochondrial bioenergetics, ROS formation, and proinflammatory responses. We found that SIRT3 expression was significantly diminished in lungs of mice subjected to LPS-induced ALI. SIRT3-deficient mice (SIRT3–/–) develop more severe ALI compared with wild-type controls (SIRT3+/+). Macrophages obtained from SIRT3–/– mice show significant alterations in mitochondrial bioenergetic and redox homeostasis, in association with a proinflammatory phenotype characterized by NLRP3 inflammasome activation. The SIRT3 activator viniferin restored macrophage bioenergetic function in LPS-treated macrophages. Viniferin also reduced NLRP3 activation and the production of proinflammatory cytokines, effects that were absent in SIRT3–/– macrophages. In-vivo administration of viniferin reduced production of inflammatory mediators TNF-α, MIP-2, IL-6, IL-1β, and HMGB1, and diminished neutrophil influx and severity of endotoxin-mediated ALI; this protective effect of vinferin was abolished in SIRT3–/– mice. Taken together, our results show that the induction/activation of SIRT3 may serve as a new therapeutic strategy in ALI by modulating cellular bioenergetics, controlling inflammatory responses, and reducing the severity of lung injury. Proposed mechanism of SIRT3 deficiency in exacerbation of endotoxin-induced ALI. 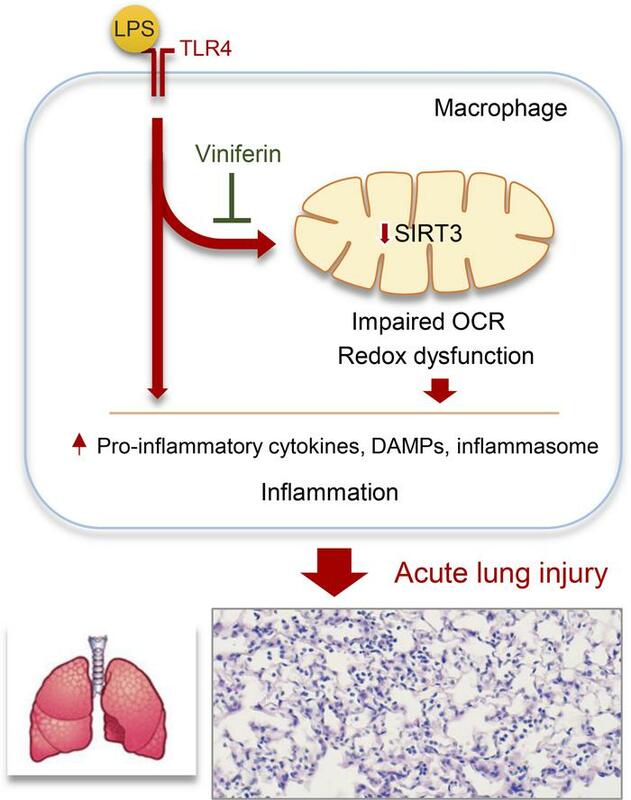 ALI induces SIRT3 deficiency in lungs of LPS-treated mice in association with increased inflammation and worsened ALI. Viniferin modulates mitochondrial bioenergetics, production of proinflammatory cytokines and DAMPs, as well as inflammasome activation. Pretreatment of mice with viniferin reduces inflammation and severity of endotoxin-induced ALI.